Dorin Bruno, 2017. “India and Africa in the Global Agricultural System (1960-2050): Towards a New Sociotechnical Regime?”, Economic & Political Weekly, LII:25-26, June 24, pp. 5-13. The asynchronous but somewhat similar agricultural trajectories of sub-Saharan Africa and Asia, especially India, are analysed over nearly a century (1961–2050). Millions of pieces of data available on the past (1961–2007) and on a plausible future (2006–50 projections by the Food and Agriculture Organization) are organised in a simple world food model where production, trade and consumption are aggregated and balanced in calories. 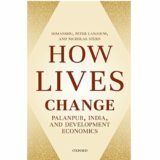 Given the current and/or future land–labour relationships that characterise India and Africa, can these regions experience the same structural transformation that the developed countries went through, or work together towards a new sociotechnical regime by developing their own regionally differentiated labour-intensive production investments and technological capacities for economic, social, and ecological sustainability? India and Africa in the Global Agricultural System (1960-2050): Towards a New Sociotechnical Regime? (PDF Download Available).